Michael Drayton (1563-1631), Poet. Sitter associated with 10 portraits. 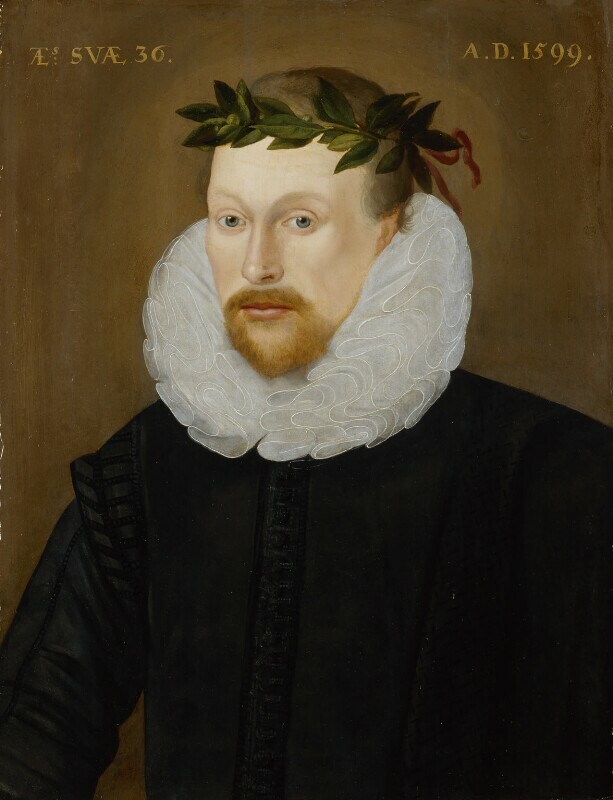 This portrait was re-identifed as Michael Drayton following detailed technical analysis proving the authenticity of the crown of laurel branches. The picture dates from 1599 and the inscribed age at this date matches Drayton's own. Following the death of the poet Edmund Spenser in 1599, Drayton was one of the main contenders for the unofficial role of Poet Laureate. Robert Devereux, Earl of Essex's campaign in Ireland is unsuccessful. He signs a truce with the leader of the rebellion Hugh O'Neill, Earl of Tyrone and returns to England without royal permission. He is placed under house arrest on his return to court. King James VI of Scotland (future James I of England) writes Basilikon Doron ('The Royal Gift'), which asserts his theory of the divine right of kings. The Globe Theatre is built in London. William Shakespeare's Julius Caesar is performed for the first time. Death of the poet and administrator Edmund Spenser, author of The Faerie Queene. Birth of the painter Anthony van Dyck in Antwerp (in present-day Belgium). Michael the Brave, Prince of Wallachia, deposes Andrew Báthory, Prince of Transylvania. Akbar, Mughal Emperor of India, leads a campaign of conquest into southern India. Underneath this portrait may be another, of Shakespeare. To better discern the dating and identity, teraherz photography should be carried out, perhaps?